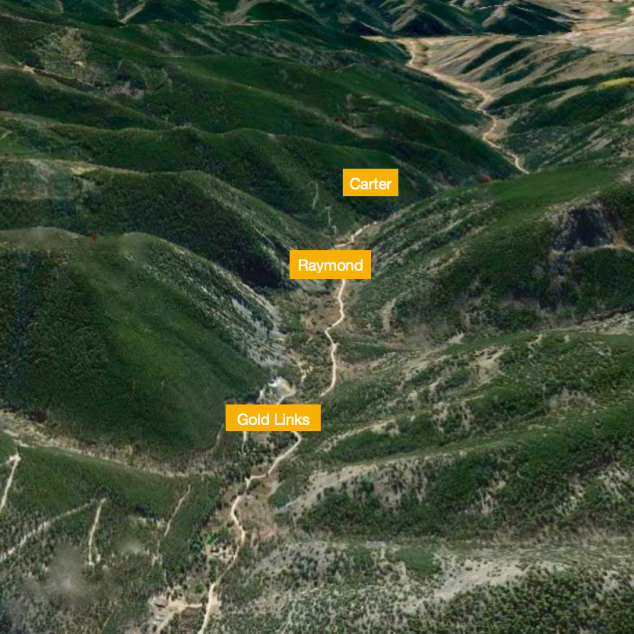 Dateline has significantly strengthened its Colorado precious metals portfolio with the acquisition of the Raymond and Carter gold mines which adjoin Dateline’s Gold Links property. The Raymond and Carter mines are highly prospective historical gold mines covering approximately 1,300 acres of freehold land. Dateline now owns approximately 8km2 (2,000 acres) of freehold land and has mineral leases (unpatented claims) over an additional 600 acres of land. Dateline views the Gold Links, Raymond and Carter mines as being a part of a single large mineralized system and believes there is considerable value to be unlocked by approaching future exploration from this perspective. The ground in between each of the mine adits and drifts far exceeds the areas that have been worked by the ‘old-timers’. The following is a summary of the three mines from the perspective of a single mineralized system and the reason each operation ceased. Gold Links is the northern most development. The 1,200 metre Gold Links adit was driven at the 9,600 foot RL to undercut the Sacramento vein at the 10,200 foot RL and discovered the high grade 2150 vein, 655 metres (2,150ft) from the adit portal. The 2150 vein was extensively mined above the adit level. The Sacramento vein is believed to have been intersected at 1,005 metres (3,300ft) from the adit portal but was not extensively mined. Horizontal development at Gold Links – Sacramento totals 5.2 kilometres over several levels. Production stopped due to low gold prices and the ‘old timers’ losing the vein. Raymond is the central development situated 1.3 km to the south of Gold Links. The 1,510 metre (4,950ft) Raymond adit was driven at the 9400 foot RL to undercut the Raymond seam and intersect the NE extension of the Golden Islet-Chicago workings. It was then extended eastwards to intersect the Volunteer-Chloride-Grand Prize line of workings. Horizontal development at Raymond totals, 3.2 km over several levels. Production ceased in the early 1940’s. Carter is the southernmost development, 1.5 km to the south of Raymond. The 2,020 metre (6,600ft) Carter adit was driven at the 9200 foot RL to undercut the Golden Islet-Chicago workings and then extended eastwards to intersect the extensive Volunteer, Chloride and Grand Prize workings. The Carter adit was connected to the Volunteer workings via a 345 metre vertical raise. Horizontal development at Carter totals 3.6 km over several levels. Production ceased in 1982. The area has not been mined or explored in the modern era. *This report cannot be verified and there is no JORC compliant evidence that it is correct, nor is DTR stating that it will be successful confirming this estimate. As part of our near-term strategy, we intend to conduct a JORC compliant exploration program over the area and report the results as they become available. Map shows Dateline’s combined freehold landholding in the district hosts the Gold Links, Raymond and Carter mines (red lines) and the map of the old workings (blue lines). The area in between has been lightly explored predominantly from surface between 50 and 100 years ago. This is the first time these properties have been owned by a single company. A program to digitise all of the old maps and workings that include a significant number of assay results taken from surface samples is currently underway. When completed, the digitised data will be used in conjunction with a 3D seismic survey of the area that is planned for the northern hemisphere summer. The objective of the program is to detect potential high-grade shoots of the numerous veins and better understand the overall distribution of the shoots within this mineralised system. Work on the 2150 vein on the Gold Links property in 2017 has demonstrated that the high-grade gold shoots are associated with heavy sulphide (galena and pyrite) with the remainder of the vein being quartz and carbonate. This mineral density contrast should make any mineralised shoots on our land clearly evident in a 3D seismic survey. The surface projections of the known veins are expressed as changes in contour of the topography.